Is there any food as universally loved as pizza? I think not. As much as my energy and moods have improved from removing grains from my diet, hardly a day goes by when I don’t dream about the satisfaction of sinking my teeth into a thick, gooey, melty slice of deep dish pepperoni. Memories of class parties, adolescent sleepovers, and late-night study sessions come flooding back with every bite. Recently the siren call of pizza reached a fever pitch and I had to do something. So I modified a no-brainer pasta dish I used to make called ‘pizzaroni’. Just like it sounds, it’s all the flavors of pizza but in a baked macaroni format. I’ve been replacing pasta with spaghetti squash in many other instances lately, so I reasoned that the fibrous gourd might make a reasonable subsitute in pizzaroni too. Dare I say I like the spaghetti squash version of this dish even better than the macaroni original? All the elements of pizza are present: the bubbling cheese, the drippy sauce, and if you’re so inclined, the crispy pepperoni topping. Granted it’s not quite the same without the crust, but if you’re craving joyous pizza vibes without the grains, this recipe will make you very happy indeed! Preheat oven to 425. Quarter spaghetti squash, place on a baking sheet uncovered with the insides facing up, and bake for about 45 minutes. (I find this method is best for preventing watery “noodles”). Let squash cool and scrape out the insides, then combine in a large bowl with pizza sauce and diced tomatoes. You can vary the sauce quantities if you like a saucier casserole. 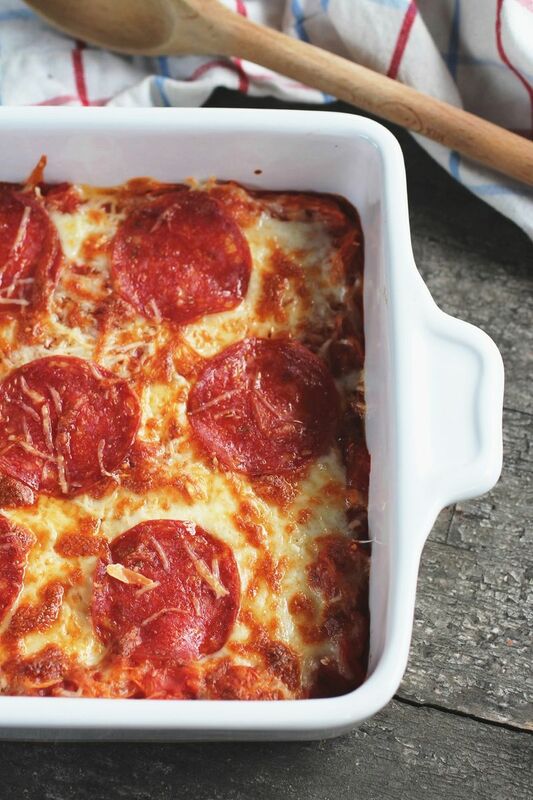 Place mixture in a baking dish, sprinkle evenly with cheese and toppings, then bake until bubbling. Brown the top by putting the dish under the broiler immediately before serving. P.S. Try more of my fave healthy recipes! Check out my paleo waffles, hearty Mexican pozole soup, and baked apples that taste just like apple pie but without the sugar! sounds delicious. I will definitely try it.